Three major changes to the pattern made this shirt very functional as a travel shirt: a vented back yoke, front zippered pocket and zippered side vents/pockets. Following is a tutorial for each change. 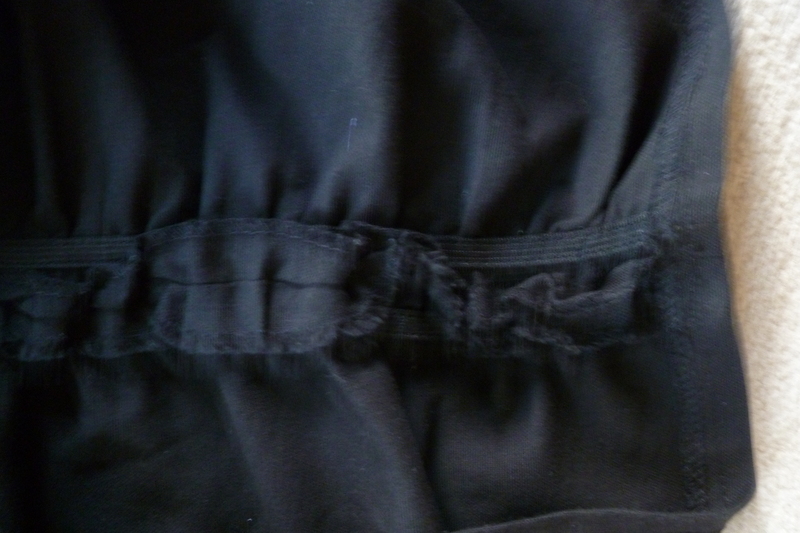 3 invisible zippers – I used long zippers and cut them to the desired length. 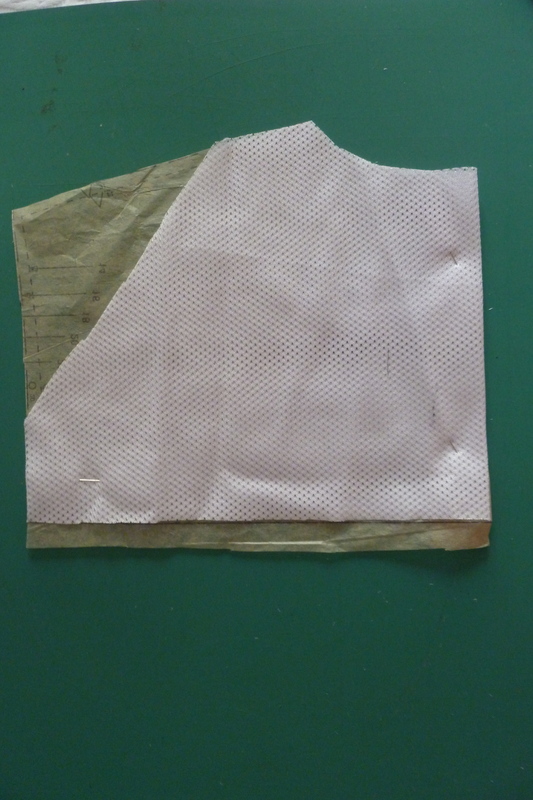 To make this change in your pattern you will cut: a) one yoke from mesh fabric and b) one yoke from the fashion fabric, extending the length by 1″. 1. 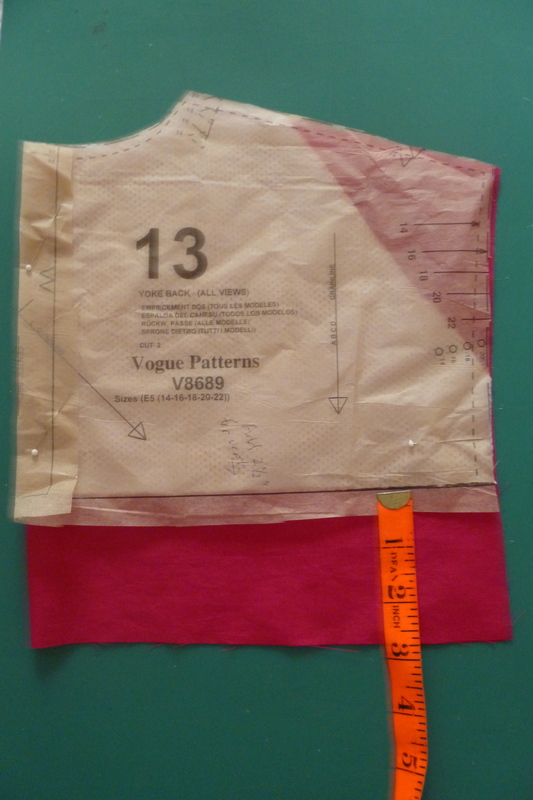 Cut one yoke front he fashion fabric, extending the length by 2″ as in the following photo (I extended it by 3″ but ended up cutting off 1″). 2. Cut a back yoke from mesh fabric. 4. Serge or zig-zag the diagonal edges. 5. Sew the mesh to the lower back piece with the right side of the mesh against the wrong side of the lower back piece. 6. Top stitch close to the seam-line. You are now ready to attach the fashion fabric yoke. 1. 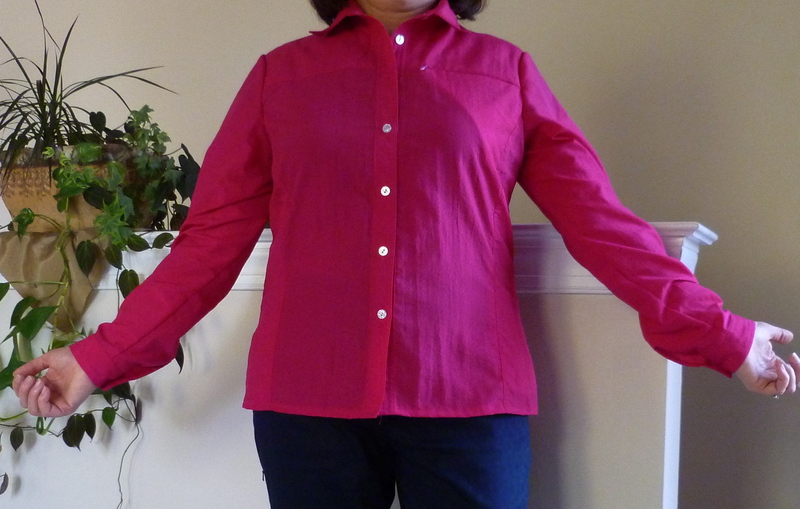 Finish the lower part of the fashion fabric yoke by turning the hem twice (1/2 to 5/8″ rolled hem). 2. 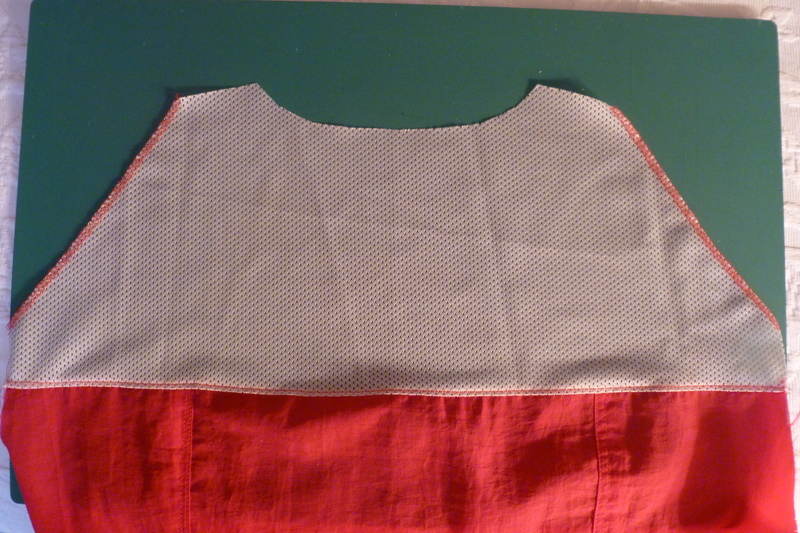 With the shirt back and the yoke wrong side down, lay the yoke on top of the mesh, matching the edges. Pin in place. 3. Top stitch the yoke at each end (about 1″ of stitching) and at the middle (1.5 to 2″). The remained of the yoke will not be attached to the lower back, allowing air to flow (i.e. venting). The arrows on the following show the top-stitched areas. 1. 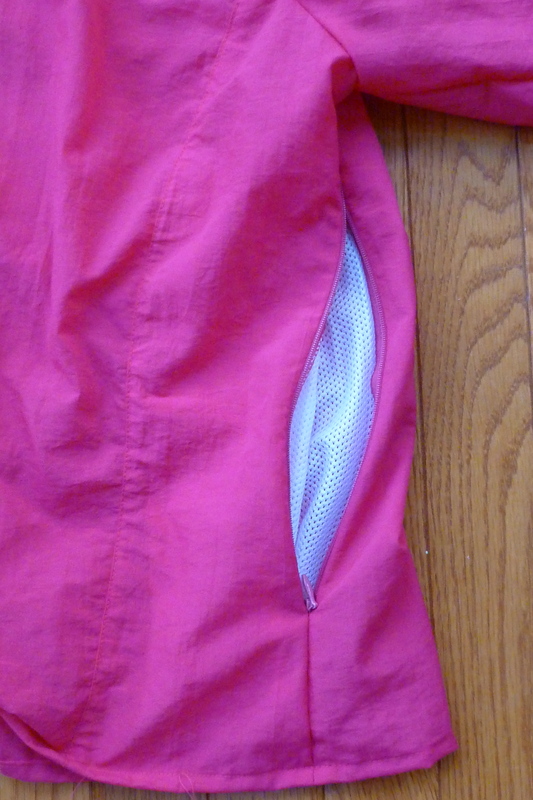 When sewing the front yoke to the front bottom pieces, insert an invisible zipper into the seam. The zipper should be ~1″ from each edge. On a size 16 shirt, this made a 5″ opening for the pocket. 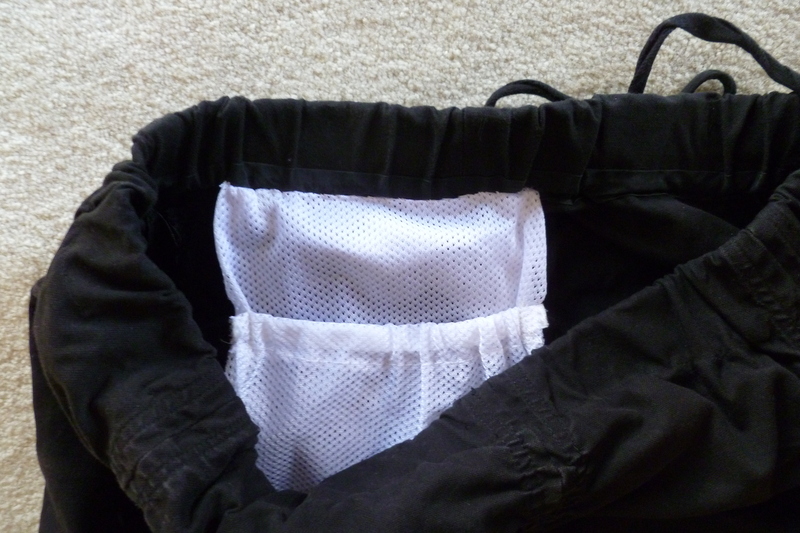 Note: If you want more pockets, you could do this on both sides of the front. 2. 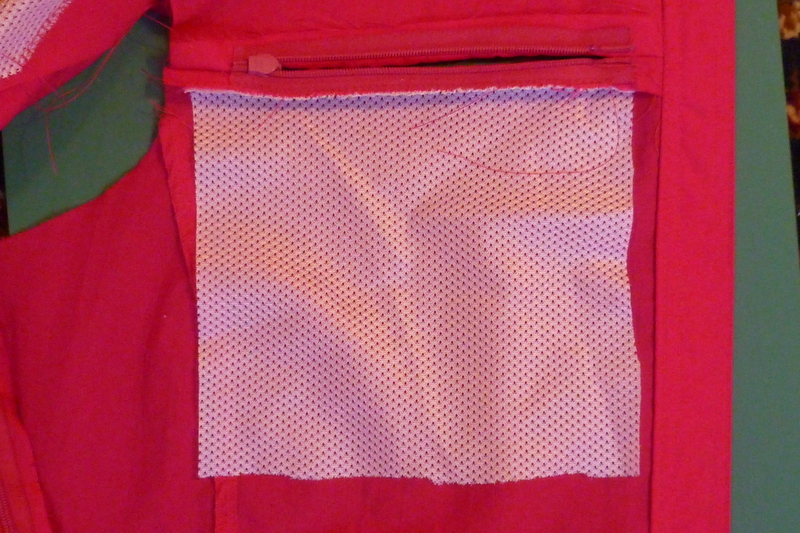 Working on the wrong side of the fabric (to make the underside of the pocket), sew a 5-1/2″ by 5-1/2″ piece of mesh, to the bottom of the zipper tape. 3. 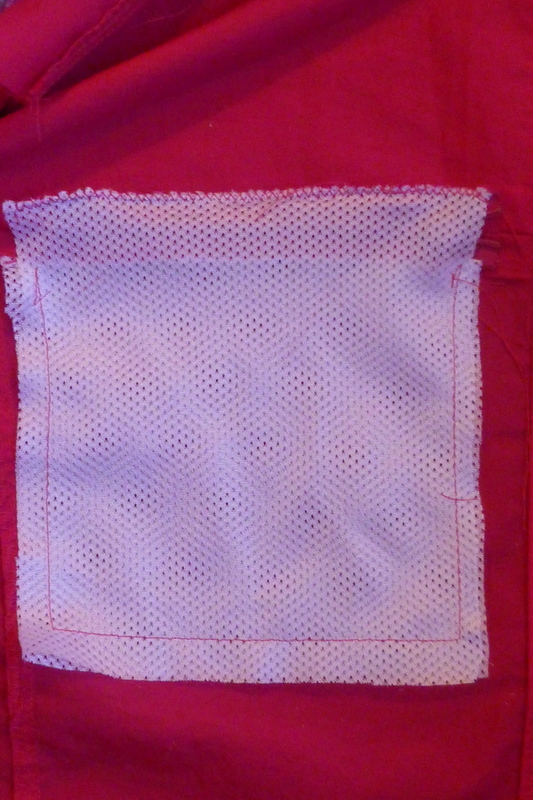 To make the upper pocket piece, sew a 5-1/2″ by 6-1/2″ piece of mesh to the upper zipper tape or seam allowance. I zig-zagged the edges together. 4. Pin the pocket pieces together. Sew edges as in the following photo. You will notice that on the pocket sides you are unable to sew all the way to the top however this won’t alter the functionality of the pocket. 5. Serge or finish the edges to your liking (I didn’t but if would look better if I’d taken the time to do it. 2. 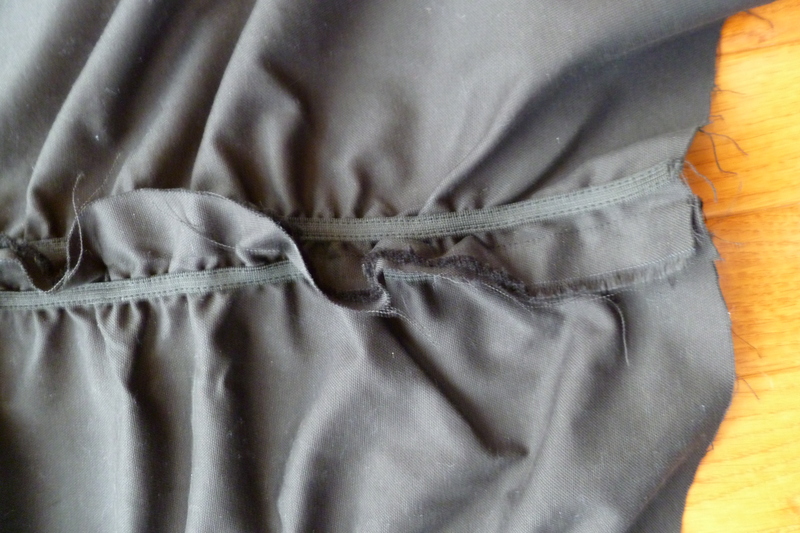 Sew the seam above and below the zipper. 3. 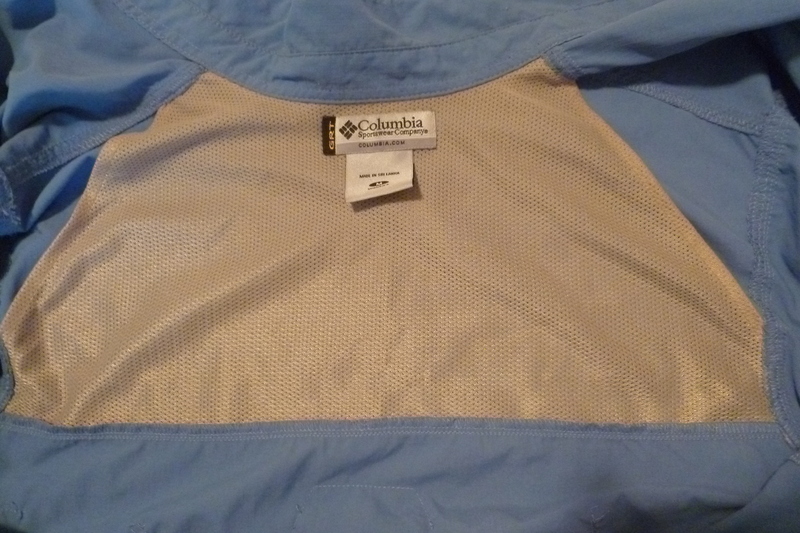 Using a 10″ wide by 12″ long piece of mesh, sew each side of the mesh side to each side of the zipper tape to form a single piece which will become a vent and a pocket. 4. 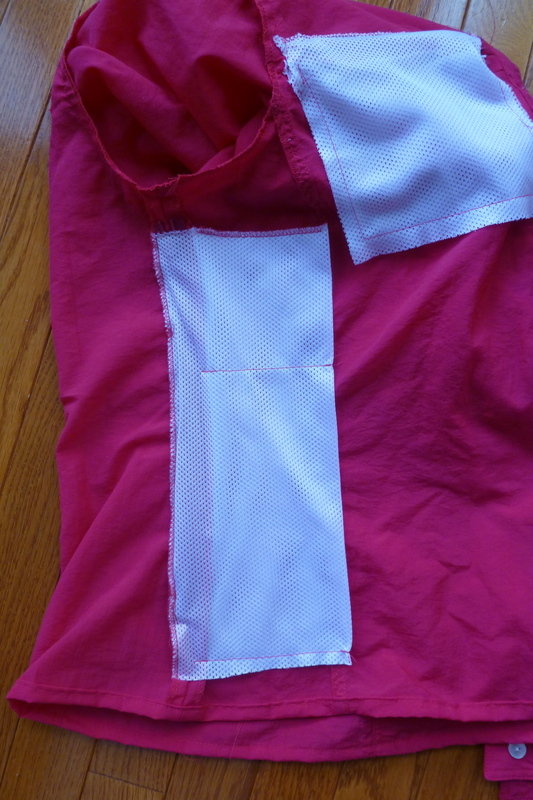 Fold the vent/pocket toward the shirt front. 5. Sew the front seam and the bottom seam of the vent/pocket. Finish edges if desired. 6. Run one more stitch approximately 4″ from the top of the vent/pocket. I’m not sure if this is needed but my thought was that this line of stitching would form the pocket. 7. Hand stitch the top and bottom edge of the vent/pocket to the front princess seam to keep it in place. 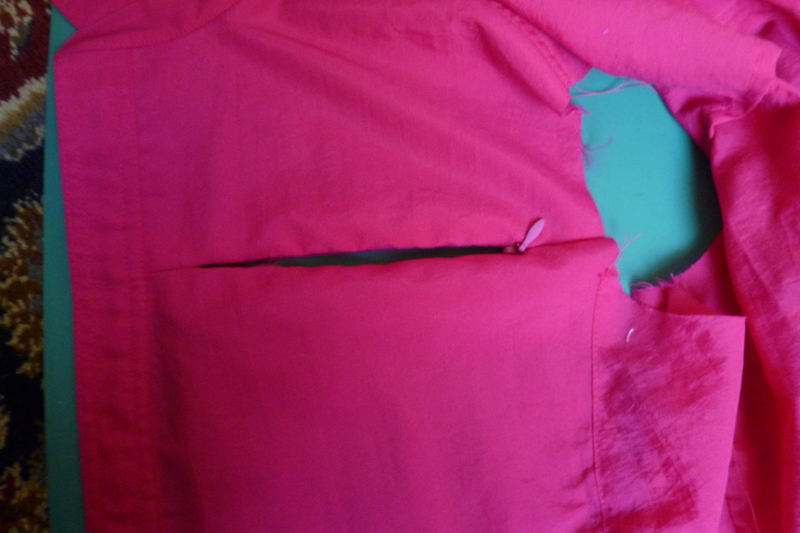 One more note: Inadvertently, I placed one zipper with the pull at the top and one with the pull at the bottom. When wearing the shirt I realized that both directions have advantages, so I’ll leave that choice to you. Of course, what does it matter if the garment isn’t functional. This shirt worked so well that I wore it all the time, as you can see in the following photos (oh yes, and we had fun too). Now, I need your feedback. 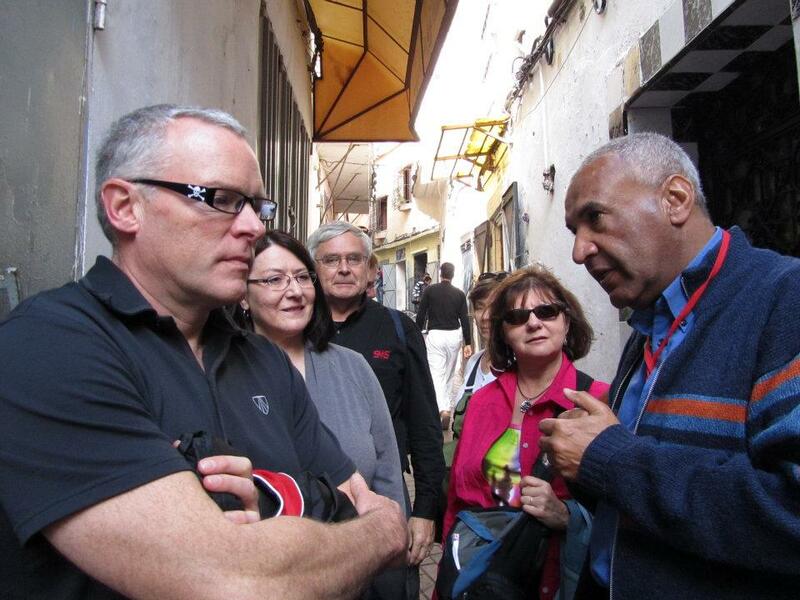 Just having returned from several weeks in Spain, I’m still in the mode of thinking about travel clothing – what worked and what didn’t. In the coming weeks I’ll share some tips on making travel clothes but for now I need to tell you about this travel skirt which is sooo comfortable. Initially I made it for our 2 month trip to Central America where it got a lot of wear. I liked it so much that although faded and somewhat worn, I took it on this trip to Spain. Honestly, it’s the most comfortable skirt I’ve ever owned. 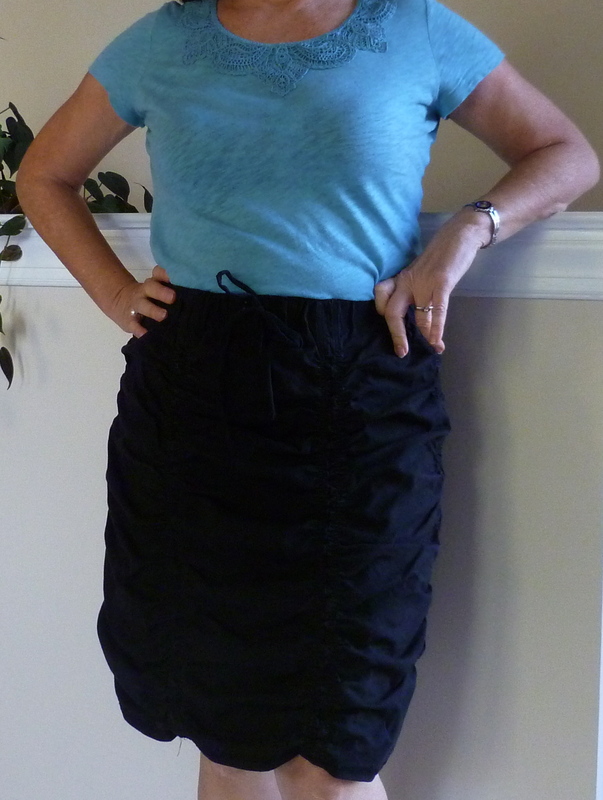 The inspiration came from a travel skirt on an internet site I can no longer find. Essentially it is made of 6 panels with ruching on each side of the seams, made from woven cotton/poly with lycra. This photo is a little better at showing the detail. 1. Before cutting or sewing, do a test with the elastic and a fabric scrap to determine the ration of elastic to fabric needed to create the desired ruching effect. 2. Cut six pieces of fabric 9-10″ longer than the finished length (mine was 30″ for a 20″ skirt). For the width, use the following formula. Divide hip size by 6. For each piece, add 1-1/2″ for the seams and 1″ to create the puffy effect. 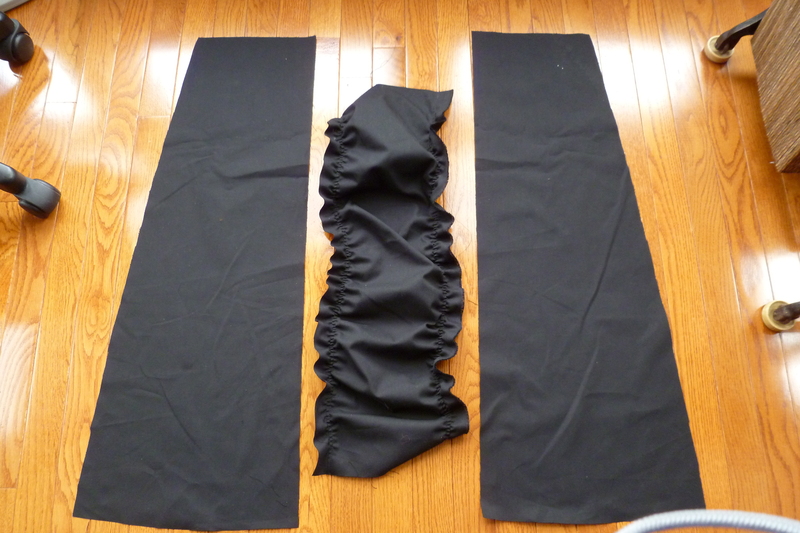 If desired, you can flare slightly, making the lower part of the skirt wider. For 40″ hips, my panels were 30″ long by 10″ wide at the top and 11″ at the bottom. Cut panels. Middle panel has elastic applied. 4. Serge or zig-zag edges to reduce raveling. 5. 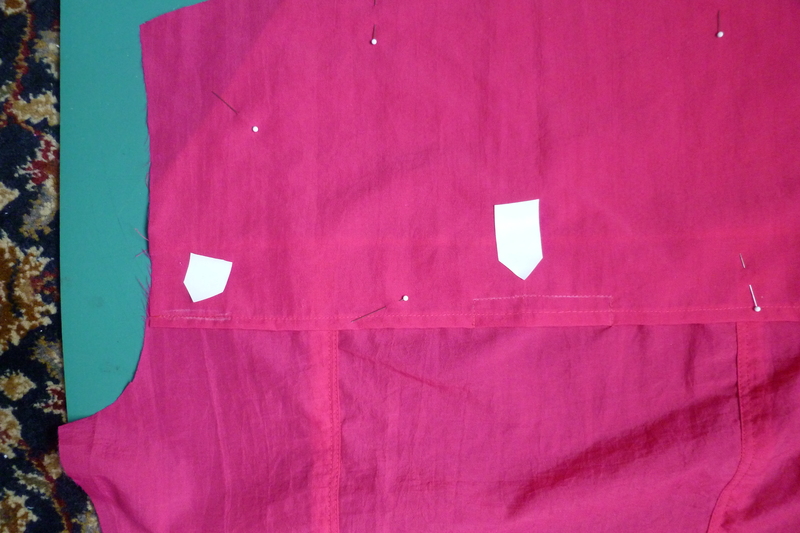 Starting 2′ from the waist edge, stretch fabric while sewing to each side of panels, one inch from each edge. 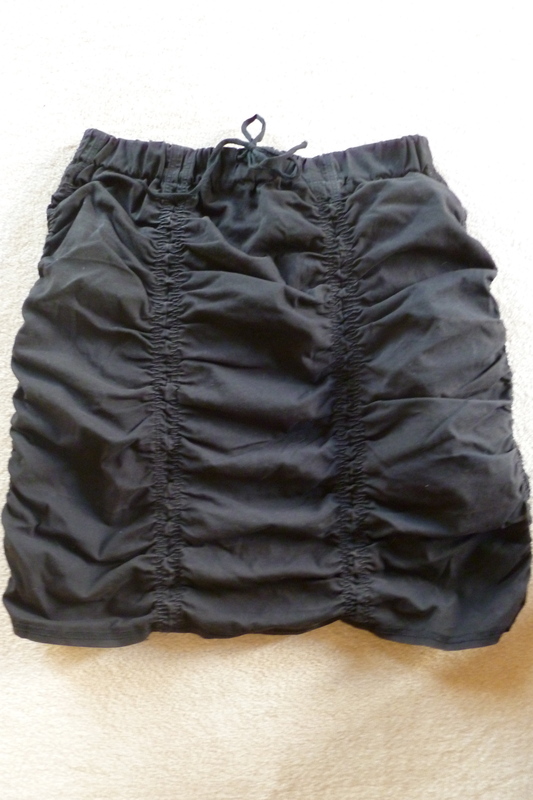 Note: You start 2″ from the top as ruching in the waistband makes it too bulky. 6. 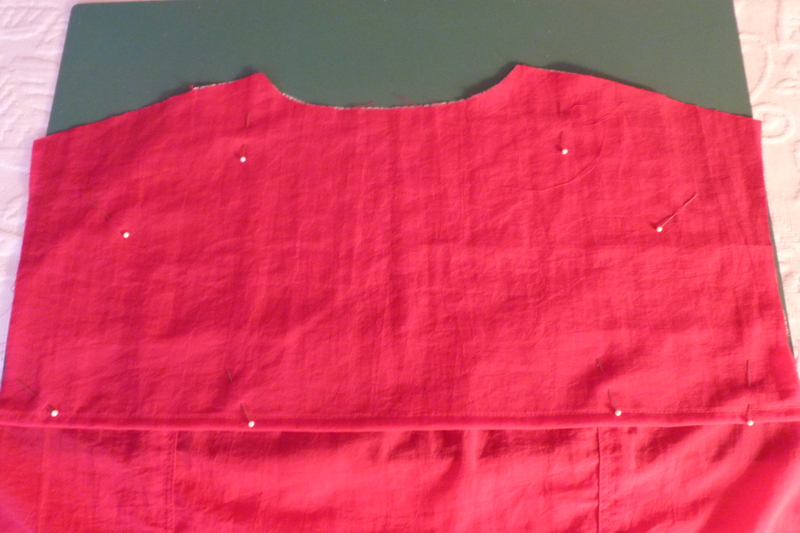 Sew panels together with a 5/8 to 3/4″ seam. Press the seams open although this is somewhat useless as the seams don’t lay flat. 7. Repeat for all panels. 8. 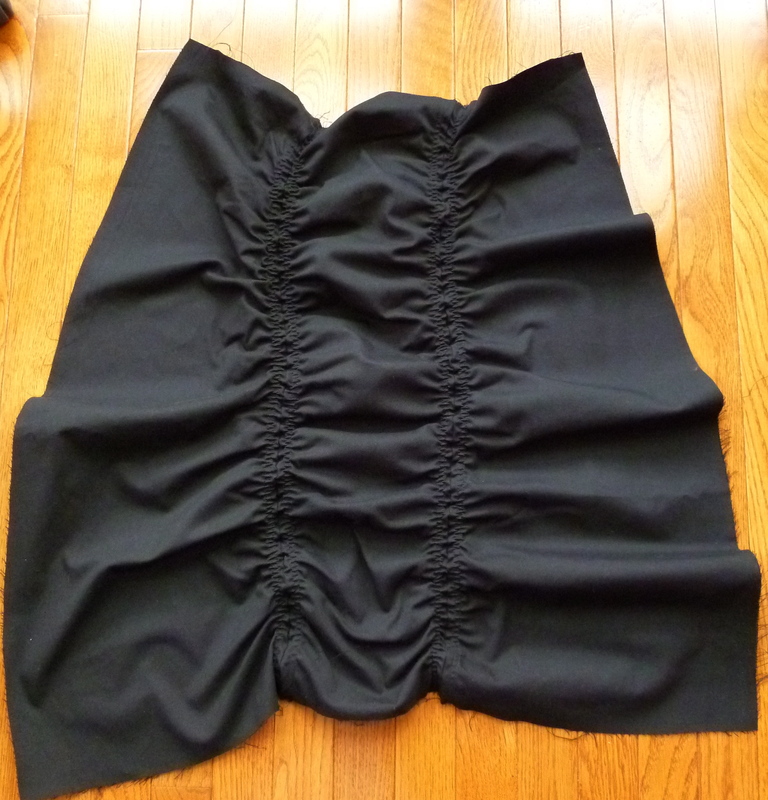 Turn waistband over and sew 1-1/2″ from the edge. 9. Insert elastic to desired length. Note: I also put a twill tie in the waistband but it’s not necessary. 10. Turn over 5/8″ at the bottom edge for a hem. Machine sew with a straight stitch. 11. Because there aren’t pockets in this skirt, to have a secure place for my passport, add a travel security pocket on the inside. You are done! Roll it up and put it in your suitcase. 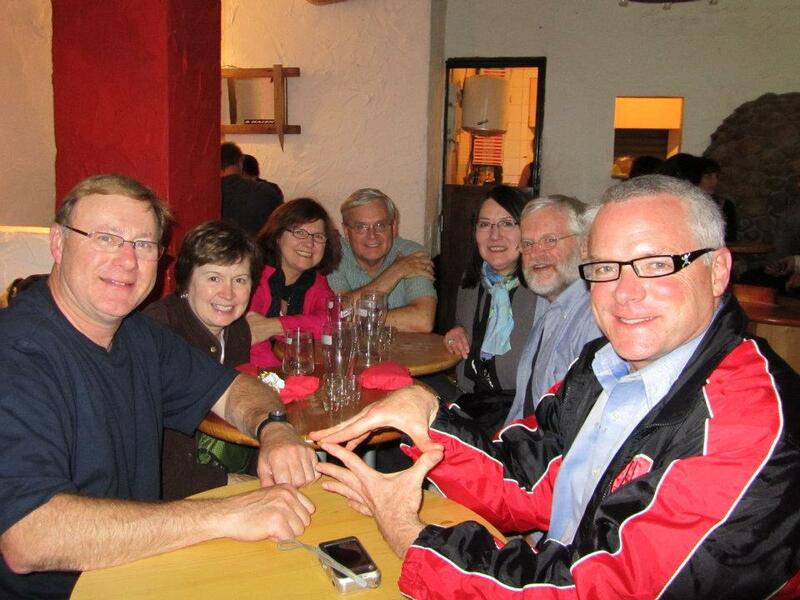 Not much blogging in the next several weeks as Kevin and I are traveling to Spain with some of his family. 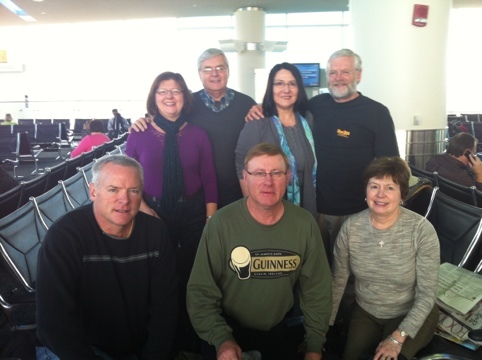 To be specific, our travel mates are 2 of Kevin’s brothers, (one is married to my cousin), his sister and her husband. We convinced all of them to travel light, only taking carry-on’s, and they all passed the minimalist travel test.